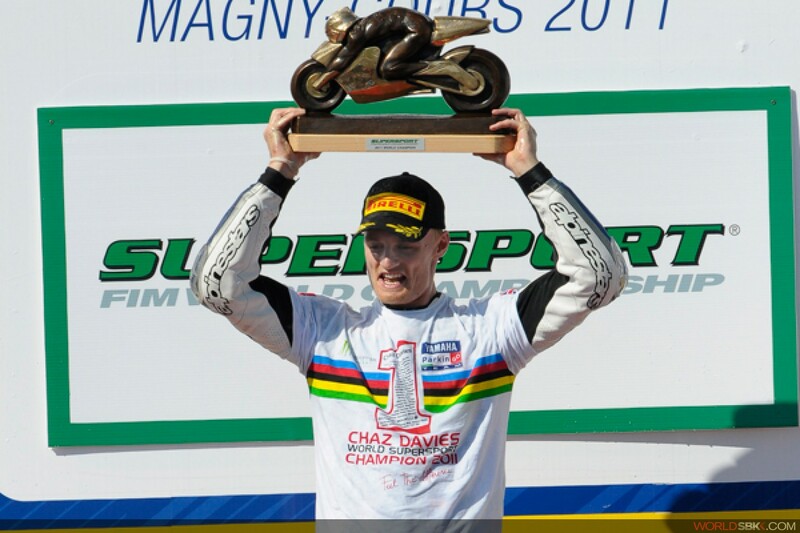 Chaz Davies (Yamaha ParkinGO) took the overall victory in the Supersport World Championship after finishing sixth at Magny-Cours, in a race won by his team-mate Luca Scassa. Sam Lowes (Parkalgar Honda) was second today with long-time leader Broc Parkes (Kawasaki Motocard.com) just holding off his rapidly advancing team-mate David Salom for third. James Ellison (Bogdanka PTR Honda) was fifth, as Davies eased to the title and a new total of 181 points with one round left to run. Fabien Foret (Hannspree Ten Kate Honda) was only eighth today but remains second overall, in 144 points. Parkes is third in the points, on 136, tied with Salom.